Growing up I lived in an office building a good portion of my childhood. Well, upstairs of one. Still with my parents always busy me and my brother spent a lot of our free time on the computers. Their business was predominately mac-based. We had the multi-colored iMacs, I remember my first computer was a blueberry one. Upon the office receiving its first Windows computer a whole new door of computer gaming opportunities we had two particular games that were an obsession of ours: The Sims and Rollercoaster Tycoon 2. 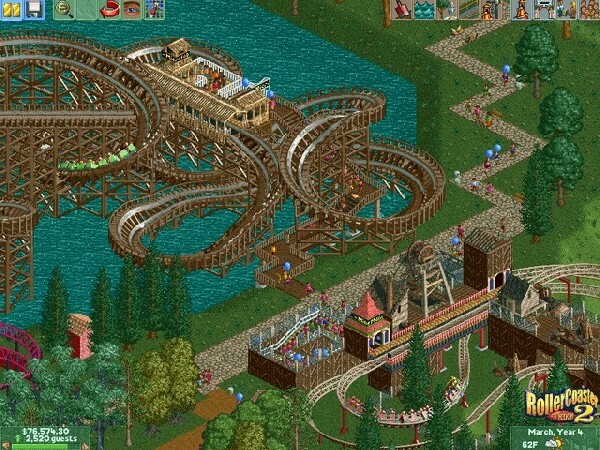 We did play the first Rollercoaster Tycoon and it was incredible. You build and manage your own theme parks, complete scenarios, design roller coasters and it was hours upon hours of fun. The reason it’s sequel is the classic is mainly because it had much more you could build and create. More like an expansion pack upon the first. You can start out with a pre-made theme park or start from scratch. I always loved starting from scratch. You open your theme park when your ready, and I would always start building smaller rides and then construct roller coasters. You can adjust prices on what the guests pay for but you have to be cautious on building food stands and restrooms to keep your guests entertained. What makes a video game addicting is how much a person wants to complete the goal the video game presents. The goal doesn’t end with building a theme park, it can just expand and expand. Don’t worry, after maybe 30 hours you might eat. This game is incredibly fun and at times challenging. I come back and play this game at least twice a year now. I consider it a classic not just because I logged a lot of hours of my life to it and that it was a childhood game. But because it is fun, simple as that. It’s an old game, but if you can log onto Amazon or Ebay and get it cheap. They simply don’t make games like they use to. The following game Rollercoaster Tycoon 3 was horribly tedious and not nearly as fun. 2 is what you want to go with.